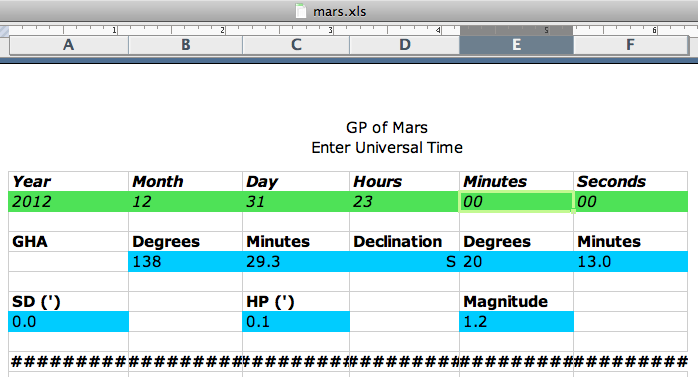 A customer recently asked whether there is a spreadsheet in this suite that would show which celestial objects are available for observation at a given time from a given location. While the short answer to this query is “no”, this capability does exist in the combination of an almanac spreadsheet with intercept.xls. If the computed altitude Hc is positive, then the object is above the horizon. 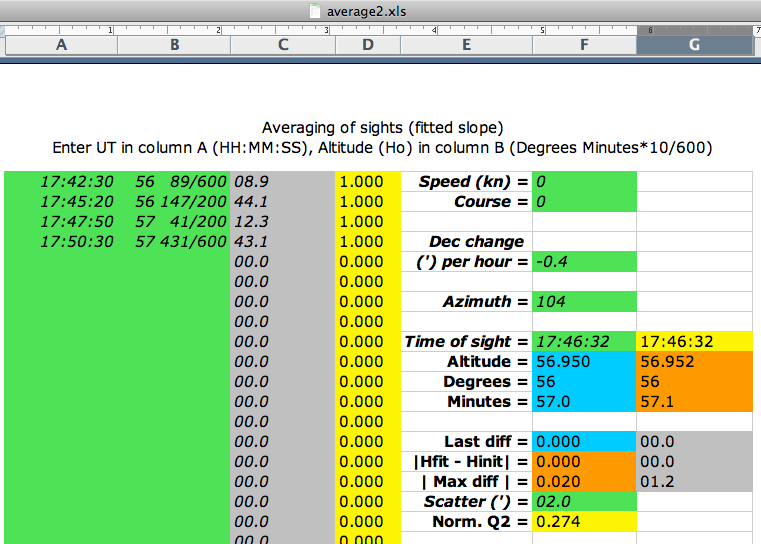 That said, at least for stars one can use the what_star.xls spreadsheet for that purpose. You enter the UT and your location and then scroll to the right to column AI. If the computed altitude (Hc) is positive, then that star (star names are copied into column AF) is above the horizon. Column AH has the star’s azimuth. In the following example Acrux is above the horizon, whereas Acamar and Achernar are not. In this manner you can scroll down in the spreadsheet to inspect all 57 main navigation stars for availability. The “Blank” version of the T-Plotter facilitates the plotting of LOPs on charts of any scale. Distances are marked directly on the plotter with a dry-erase marker (not included). For more information click here and view the demo video here. 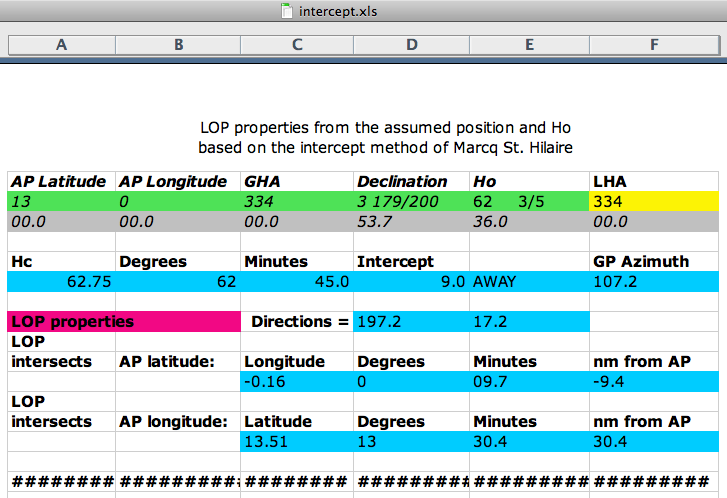 According to the intercept method of Marcq St. Hilaire a celestial line of position (LOP) is plotted on a chart as the line perpendicular to the azimuth line at the intercept distance toward or away the geographical position (GP) from the assumed position (AP). This can be accomplished with the T-Plotter®- a device consisting of two mutually perpendicular arms: the azimuth arm that is lined along the azimuth line, and the plotting arm along which you can plot the LOP. The use of the T-Plotter reduces the clutter on the chart by eliminating the need to also plot the intermediate (and usually not needed) azimuth line. The Sailings calculations determine the course for a vessel to follow in order to get from the point of Departure to the Destination. This is course with respect to ground which can differ from the course to steer if the vessel is deflected sideways by currents and/or winds. This leads to a class of “set and drift” problems described, for example, in the Dead Reckoning chapter in Bowditch. These problems are often solved graphically by plotting procedures. As for the equivalent numerical solution we can do the following. The essence of these problems is the relationship between three vectors in which the ground speed is the vessel’s speed relative to the water plus the set and drift vector. The relevant geometry occurs in 2-D, so this relationship translates into two equations for the vectors’ components. Therefore, given four pieces of information on input we can solve for the remaining two. Calculation of the ground speed from the current’s speed and direction (i.e. set and drift) and the vessel speed relative to the water. Calculation of the required vessel speed and course from the set and drift and the desired ground speed and track. 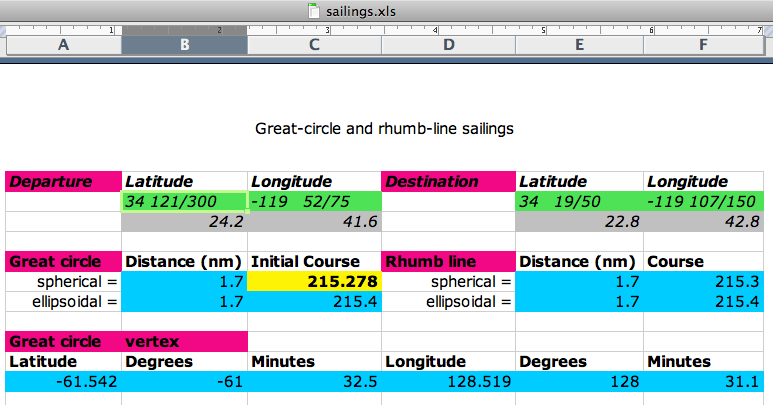 Given the set and drift, the vessel’s speed and the intended direction relative to ground, this spreadsheet calculates the required vessel course and the resulting ground speed. If the vessel’s speed is too small to counteract the current, an error message is displayed in row 4. 1) Decompose the current’s vector into components parallel and perpendicular to the prescribed “Sailings” (ground) direction. 2) Reverse the sign of the perpendicular component; this becomes the perpendicular component of the vessel’s speed with respect to water. That way the deflecting effect of the set and drift is neutralized. 3) Use the Pythagorean theorem to determine the component of the vessel’s speed (w.r.t. water) parallel to the ground direction. The known vessel’s speed w.r.t water is the hypotenuse and the result of step 2) is one of the sides. 4) Convert the vessel’s speed’s now known two components (along with the ground direction) into course to steer. 5) Add the two parallel speeds’ components in order to obtain the ground speed. If this problem has two mathematically good solutions, this picks the “faster” one. This problem does not always have a solution. If the vessel’s speed w.r.t. water is less than the current’s perpendicular component, the vessel is not fast enough to compensate for the deflection off course. If the current’s parallel component is negative (e.g. a strong headwind in case of an aircraft) and larger in absolute value than the parallel component of the vessel’s speed w.r.t. water, then the vessel is not fast enough to progress toward its destination. 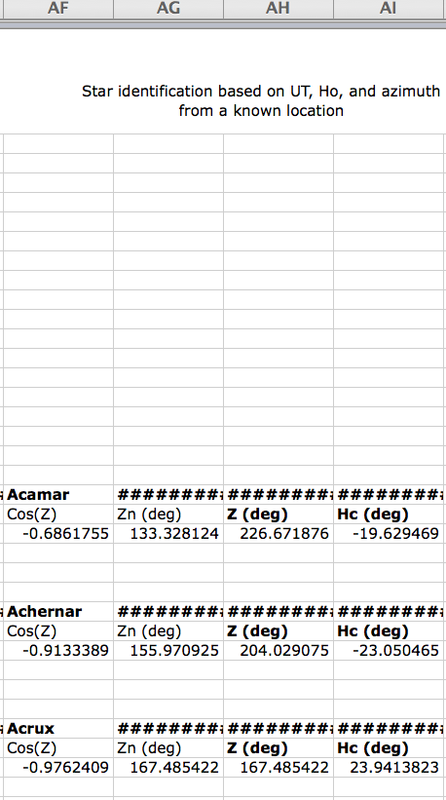 In either case, the spreadsheet zeroes out the output and displays an error message. can be used in alternative ways to plot the same line of position (LOP), as shown in this demonstration video. Comparisons with the newly published Nautical Almanac show that our spreadsheets are good for 2012 without the need for any updates. A recent trip to Santa Barbara, California, presented me with an opportunity to do some sights and calculations. In the following example I took a series of Sun sights in the morning and a single sight in the afternoon. The four morning sights were averaged to produce a single effective data point, whose LOP was then crossed with the LOP from the afternoon sight to obtain a fix. 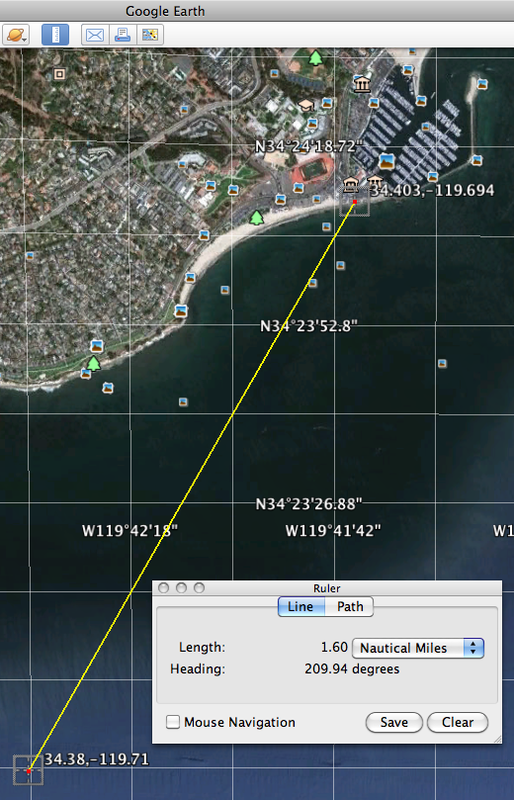 These coordinates were used as the “assumed position” (AP) in the subsequent calculations of intercepts and azimuths. 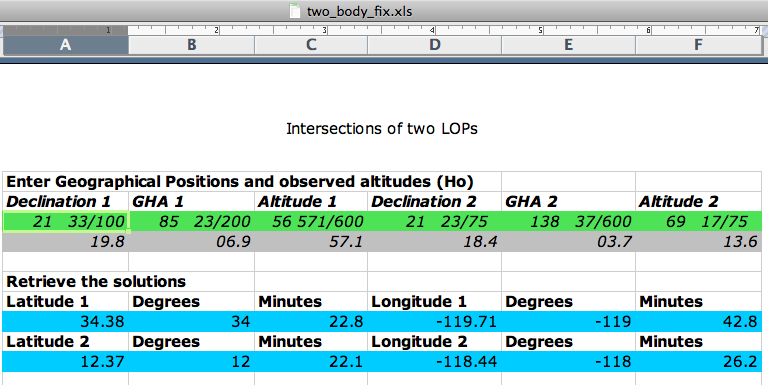 The two LOP intersections can be computed either with spreadsheet lops.xls or two_body_fix.xls. Overall I think I can be reasonably happy with these results and the intercepts I got. Considering the difficulties I had with the index error determination I was in fact a bit worried before I started the calculations. The error of fix and the standard deviation of intercepts are interestingly similar at about 2 nm. Using this value as the “Scatter” parameter in the weighted least-squares fitting procedure (average2.xls: fitted, not precomputed slope), all weights came out equal, so this procedure resulted in calculating the simple average of UT’s and Ho’s.